Rod Blagojevich is apparently rooting for the Cubs from his prison cell. 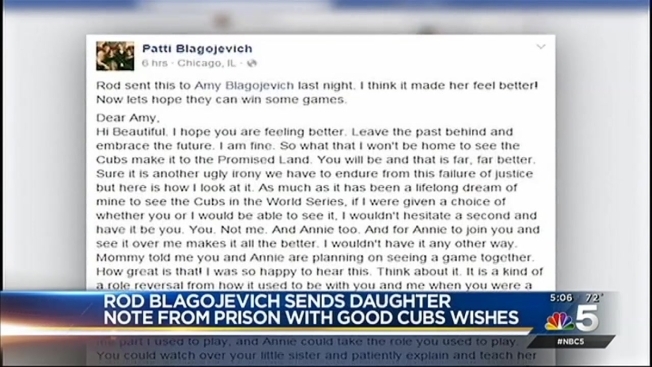 “As much as it has been a lifelong dream of mine to see the Cubs in the World Series, if I were given a choice of whether you or I would be able to see it, I wouldn't hesitate a second and have it be you,” he wrote to his daughter Amy Blagojevich. Blagojevich goes on to discuss memories he had with his daughter, taking her to Cubs games as a child, and encourages her to take her younger sister to a game. The Cubs return home to face the Mets Tuesday for Game 3 of the NLCS. The Mets currently lead the series 2-0. Blagojevich said he plans to watch the games on TV and will root for the team.